It has become a tradition for me to begin each new year at CurrentMarketing by writing a blog post with some resolutions to make the new year more productive than the last. In 2011, I chose three resolutions aimed at all ad agency employees. For 2012, I thought I would put together resolutions for the market researchers of the world. Now I’ll admit, I am still relative new to the research game. I still have a lot to learn about the business, but sometimes a fresh perspective can benefit even the most seasoned veterans. With that in mind, take a look at three resolutions that will make 2012 your most productive year to date. This past October, I attended the American Marketing Association’s Research and Strategy Summit. In several of the seminars, research executives from various industries all expressed the importance of researchers also serving as business consultants. In the new economy, clients want value. That means that not only want researchers who can dazzle them with regression models and pie charts, but also provide meaning to data. Strive to become a consultative researcher in 2012. Tell a story with the data. Clients will find more value in a two page summary with actionable items than a manual explaining every table and graph in the study. To help you become a consultative researcher, spend extra time learning about a client’s business. Familiarize yourself with their products, competitors and the industry in which they operate. Doing so will allow you to better interpret information resulting in many more projects from your clients. As researchers, we all have a tendency to be long-winded. Even when presented with simple research questions, we often produce too much information for clients. Presenting a client with too much information can cause confusion or doubt about the results. It is better to keep information both simple and direct. Every researcher wants to prove just how much time they spent on the project to the client, but trust me when I say that no client will question your dedication when you provide them a short, and direct, answer to the research question. There are several strategies that can help you produce succinct research, including being choosier about source selection and using the simplest language possible. Also, be sure to read all sources thoroughly. Obviously this takes more time, but doing so will lead to more accurate conclusions. 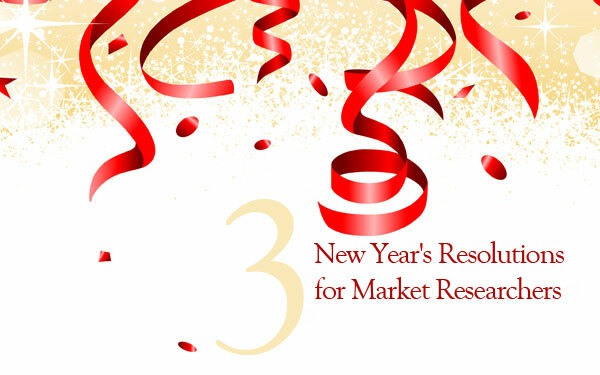 Most market researchers do not work at large research firms. Instead the majority of market research professionals work in a small department housed within companies big and small. Many companies do not fully utilize their research department only because they are not aware of all the services that research can provide to the company. If you were to examine the most successful corporations in any industry, I would bet they all have a strong commitment to research and understand the value it provides. That being said, take time in 2012 to educate your coworkers about your capabilities. A great way to educate coworkers is to hold short, fun seminars on a regular basis. Offer to buy everyone lunch. After all, research is not usually the most appealing subject for most people. This is also a great way for you to brush up on your presentation skills and to disprove the theory that all researchers are introverts. As I said in my 2011 new year’s blog, feel free to add more resolutions at any time of the year. Be sure to write down and post your goals. Share resolutions with friends and coworkers as you will accomplish much more this way than if you keep them to yourself. Have a safe and productive 2012!